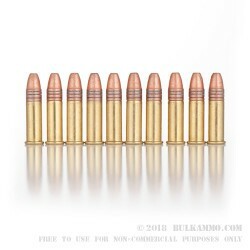 Whether you favor the 22 LR for taking small game or for good old backyard target shooting, you understand why its low price, negligible recoil, and friendly on the ears report have made it the most popular caliber in the world. 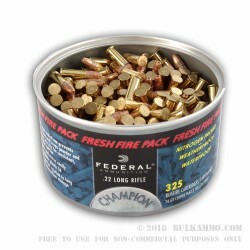 Whether you plan to go through this bundle of 325 cartridges in a day or just sit on it until whenever the time is right, you’ll appreciate its sealed Fresh Fire Pack that will keep its contents pristine for ages. 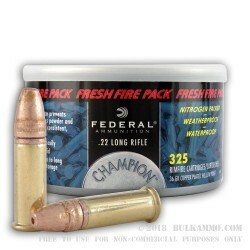 This 22 LR cartridge by Federal features a 36 grain copper plated hollow point bullet. 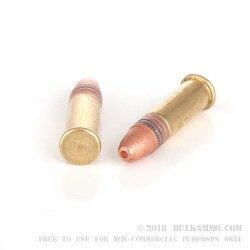 That copper plating works similarly to any other bullet’s jacket, and will keep your bore unfouled for much longer than were it exposed to lead -- you’ll enjoy great accuracy without breaking out the Hoppe's 9 as often. 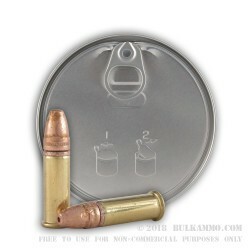 The hollow point on this projectile will expand upon impact, so it’s as lethal to squirrels as it is to empty two liter bottles filled with hose water. Based in Minnesota, Federal has innovated thousands of ammunition solutions for their customers since their foundation in 1922. 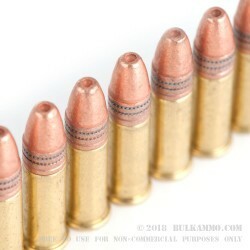 This one ought to keep the 22 LR crowd as happy as can be!